Hayward’s best-selling Super Pump just got even better! The new variable-speed Super Pump VS takes efficiency to the next level with up to 80% energy cost savings over single-speed pool pumps. VSPs are the ultimate way to save your customers energy. Most other variable-speed models, however, are oversized when compared to medium-head pool pumps. 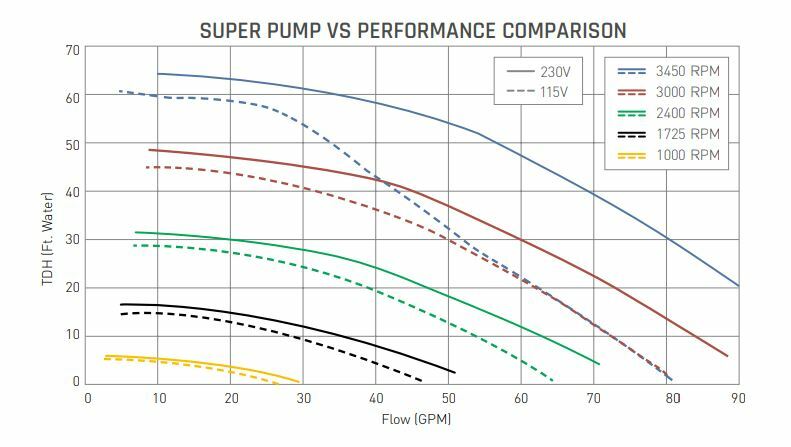 The all-new Super Pump VS is right-sized, particularly for applications with 1.5” plumbing, providing tremendous energy savings that result in an even faster return on investment. Upgrade your pools to Super Pump VS and help your customers save energy and money! 19,500 gal IG vinyl, 50 ft TDH, 44 GPM design flow rate Hayward S200 sand filter, 1.5" piping. What is the GPM at various speeds? This would be replacing a SP2607x10 1HP. Does this have enough power? Hi. This Super Pump VS Variable Speed Pump - SP26115VSP with your TDH will generate a flow rate of 35 GPM at 3450 RPM. It will be sufficient for water circulation only. what size pump for a 18 x 36 inground pool? I think its right around 30000 gallons. My filter is rated for 52 gpm max. Not sure which variable speed pump to upgrade to. Hi. To determine what size pump you need for your pool, check out Inyo's How to Size a Pool Pump for Your In-Ground Pool along with the How To Measure Total Dynamic Head With Gauges guides. A Answered on 2/16/2018 by InyoPools Product Specialist Lennox H.
Hi, Jeff. Yes, this Hayward Super Pump VS - SP26115VSP can be used to replace the Hayward Super Pump - SP2607X10 operating at 115 volts. Please click here to view the manual and you can also view it on Hayward's web site. Looking to go to a variable speed pump. Currently have a Hayward SP3007EEAZ 3/4 HP. is this a direct replacement for that? Also have a Hayward Goldline AquaPlus and it is my understanding that this pump can be controlled by the relays in the AquaPlus? This would not be a direct replacement as far the plumbing goes the plumbing ports or in a different location, so you will have some slight re-plumbing. This variable speed pump is 115V only so you have to make sure you are wanting to wire 115V, outside of that this would be a great replacement pump for your Hayward SP3007EEAZ being used with a GoldLine AquaPlus. It will depend on your feet of head, so if you can provide the distance from your pump to your skimmers I can calculate what your flow rate will be at the different frequencies. I'm looking for a pool pump to run during the day with excess solar, and am concerned about the in-rush (current surge) when the pump starts, I'm looking at the SP23115VSP, I like the low wattage loads at low speeds, but need to start it up from a 2800 watt inverter. Will this pump work? What is the startup current? Hi, Mike. This pump if prime at 3450 RPM will use 1200 watts. To find out if using an inverter to power this pump is okay I would recommend contacting Hayward at 908-355-7995.
hello! i'm looking for a replacement for my SP1750 (1/2HP) for an in-ground swim spa (3K ga). the pool has rooftop solar and we hope to add a vac-line when we replace the liner (= 50 feet of suction head + 15 ft of line to solar). currently, i'm using a 50sqft. cart-filter. if moving to this pump, would I need to upgrade to a 90-120sqft filter because of flow-rates the pump puts out? what other things should I consider in the equation? You wouldn't have to move up to a bigger filter, you're going to be at about 45 GPM with that pump. 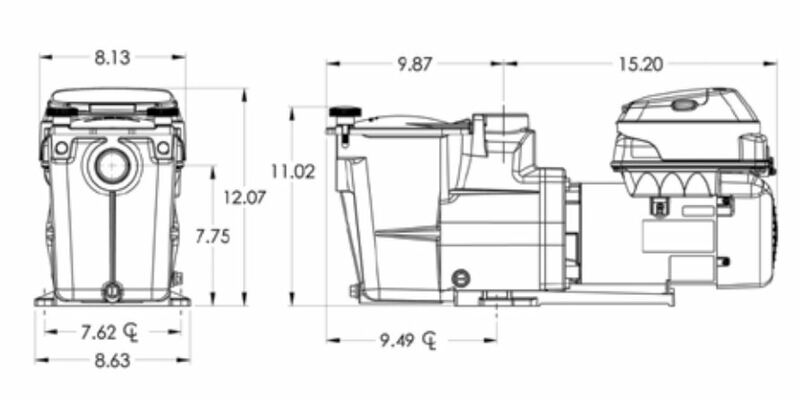 But to make it easier for you, you could move up to the 75 sq ft part number C751. Can i use Hayward Super Pump VS Variable Speed Pump (115V) with 15,000 gal in ground pool? Hi Anthony, I would recommend the Hayward Star Clear Plus 120 Sq Ft. Filter 1.5" Ports (C1200).